Chief town of the department of Côte-d'Or, France. Jews have been settled here from time immemorial. They occupied two special quarters: the first and most important comprised the whole Rue Buffon, a part of which bore, until the French Revolution, the name "Rue des Juifs"; the second, "La Petite Juiverie," comprised the Rue Piron, the lower part of the town, with a section of the Rue Amiral Roussin and of the Rue Charrue. In 1196 Duke Eudes III. presented the Jews of the village of Fénay to the town of Dijon, and the same duke "gratified" a certain Vigier with the Jew Hélie and his family in 1197. 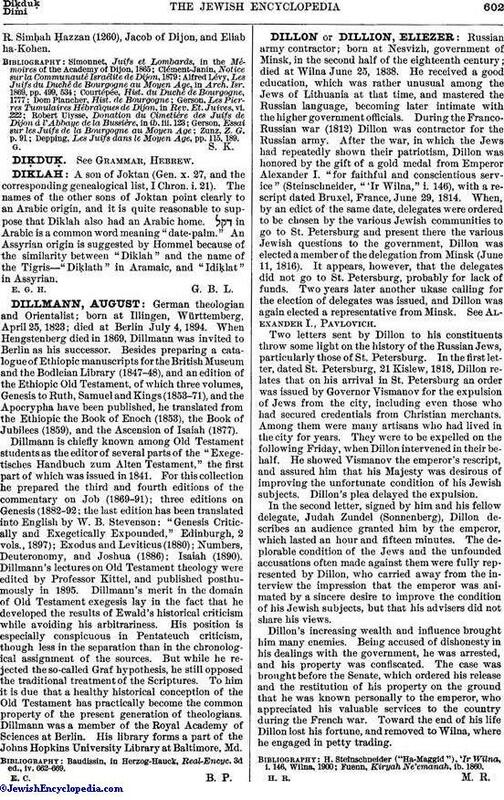 In 1204 he ceded to the Jew Valin, his creditor, the use of certain revenues. A Jew of Dijon, Bandit, the son of Benion, was the creditor of Philippe, Abbot St. Loup of Troyes, in 1216; another Jew, Salamine, made important loans to the abbeys of Sainte-Bénigne and Sainte-Seine in 1223, for which, however, Duchess Alix of Vergy, widow of Eudes III., made him sign a bill of release. Eudes III. annulled a debt due to the Jew Jessuel (1217), and Hugues IV. another, due to Dedone, "Judæus meus" (1228). At the request of David Lévy and Joseph of St. Mihiel, Philip the Bold, Duke of Burgundy, permitted twelve Jewish families to settle in his duchy in 1374. In 1379 ten Jewish families settled at Dijon. The states of Burgundy demanded the expulsion of the Jews (1382-1384); but as the latter had lent to the duke 3,000 livres for the continuation of the war in Flanders, they were authorized to remain. The duke even conferred upon them certain privileges, in virtue of which fifty-two families were to be allowed to live in Burgundy during the following twelve years, provided they paid a certain sum annually. The leaders of the Jewish community at that time were Joseph of St. Mihiel and David and Solomon of Balme. The Jews were not eager to avail themselves of the favors granted them by Duke Philip the Bold. In 1387 only fifteen families were living in Burgundy. Notwithstanding the exile of 1397, there were still some Jews at Dijon after that time: Solomon of Balme was living there as late as 1417. The Parliament of Dijon in 1730 authorized Joseph Raphael of Lazia and other Jewish merchants of Bordeaux to trade for one month in every season of the year in all the towns in its jurisdiction; but the Council of State annulled the privilege in the following year. The present community of Dijon dates from 1789. It comprised 50 families in 1803, and about 400 individuals in 1902. Dijon belongs to the "Circonscription Consistoriale" of Lyons. The ancient synagogue was situated in the Rue Buffon. In the third year of the French Revolution it was in Rue Maison-Rouge; in 1795, in Rue des Champs; in 1820, in Place d'Armes; in 1829, in a part of the apartments of the Prince of Conde; in 1841, on the ground floor of the Hôtel de Ville. The present temple, the corner-stone of which was laid Sept. 21, 1873, was dedicated Sept. 11, 1879. It is situated on the Boulevard Carnot, in one of the finest quarters of the city. In addition to the synagogue, the Jews of Dijon in the Middle Ages possessed a large schoolhouse in Rue Buffon. The ancient cemetery was situated in the Rue du Grand-Patet, behind the Jewish quarter. In 1331 Duke Eudes IV. presented to the abbey of Bussière a part of this cemetery, valued at 400 livres, an enormous sum for that time. In 1320 the cemetery was on the route to Beaune, in a place called "Les Baraques de Gevrey." Philip the Bold, in consideration of the sum of one franc in gold per capita, authorized the Jews of Dijon to own a cemetery close to the city (1373). In 1789, on their return to Dijon, the Jews bought a plot on the Chemin de Fontaine, northwest of the city, which was transformed into a cemetery; but it has, for hygienic reasons, been closed for some years. About 1160 the scholars of Dijon took part in the synod of Troyes. Among the residents of Dijon in the thirteenth century were Rabbi of Dijon (1250),R. Simḥah Ḥazzan (1260), Jacob of Dijon, and Eliab ha-Kohen. 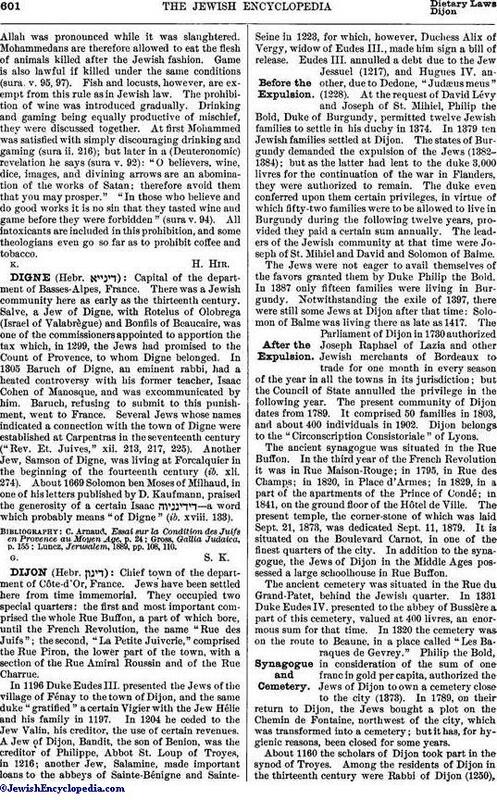 Depping, Les Juifs dans le Moyen Age, pp 115, 189.